I recently bought the Arduino Compatible Real Time Clock Module from Jaycar, and to get it going I had to do a bit of research so I thought I would share here in case anyone else could use the info! Previously I had mainly bought the ‘Freetronics‘ brand modules which are really easy as their website usually has examples, code libraries, quick start guides etc. Unfortunately the Duinotech brand seems to be lacking in this area. The supplied “Datasheet” gives you the pinout, but there is no associated ‘getting started’, or libraries / example code. Disappointingly, the Duinotech “datasheet” seems to have got the chipset incorrectly listed as D51307 instead of the correct DS1307, which means if you went searching for the correct data sheet you might not even find it! This is pretty poor from an electronics distributor to get the chipset wrong. Luckily I came across a good tutorial for this module on the tronixstuff page. The module used in the tutorial is branded under another distributor but looks exactly the same. I followed the steps in the tutorial for the DS1307, using their sample code, and was up and running in no time (pardon the pun). 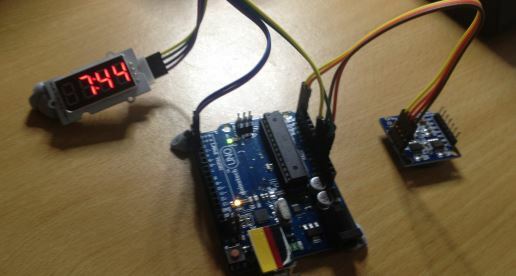 Combined with the linkersprite 4 digit display I had a test program running which shows the current time, and the current time setting is maintained by the RTC between arduino reset / shutdown.